On the warm, still evening of June 15, Malletts Bay was full of boaters enjoying Lake Champlain. Then around 6:30 p.m., tragedy struck: Two motorboats collided, and one of the pilots hit the water and disappeared. Witnesses frantically called 911. Some dove off their boats in efforts to save the man. But authorities later said Rodney Dion drowned and sank to the bottom of the lake. Police divers recovered the 60-year-old Milton man's body the next day. Speed and navigational errors likely caused the collision, according to U.S. Coast Guard Petty Officer First Class Jason Balmer, who is based at the station in Burlington. Dion and the other boat's skipper, 58-year-old Keith Wright of South Burlington, appeared to realize that they were heading toward each other, Balmer said. A critical navigation rule holds that operators on a collision course should head to starboard — their right — to avoid crashing. Instead, according to Balmer, the operators veered toward the same spot. "Both of them were making various course changes to avoid collision, but they weren't in accordance with the navigation rules," Balmer said. "And they didn't slow down, and that's what resulted in the accident." The Coast Guard was one of several agencies that responded to the collision. Balmer's summary of what happened is based on eyewitness accounts and his knowledge of the official investigation, which is being conducted by the Colchester Police Department. Police investigators, however, have not yet made a formal finding about the cause. Wright and his three passengers were not seriously injured, nor was Dion's passenger. How to pilot a boat is spelled out in the U.S. Coast Guard Navigation Rules and Regulations Handbook. But many people ignore boating regulations, Balmer said. "They are required to follow the navigation rules, but nobody knows them." The rules are covered in a state-approved boating-safety course required for Vermonters born after January 1, 1974 who operate motorized vessels and personal watercraft. People born before then are not required to take the course under a state law that dates to the early 1990s. They were exempted under a political compromise, and police say that as far as they know, neither Dion nor Wright took the course. About 30,000 Vermont residents have taken the eight-hour course, which is offered through a private company online and taught by volunteers at community centers and parks departments. One of the lessons from the Colchester fatality is to slow down and give other boaters space, said Corp. Kevin Mays, field coordinator for the Vermont State Police marine division. The tragedy is a reminder to "just give people room. There's no reason to crowd everybody out there," Mays said. "It's a big lake." He also urged compliance with the "no-wake rule," which says operators should go no faster than 5 miles per hour when they are within 200 feet of another occupied vessel. "If you're near something, within 200 feet of something, you probably should be going slow," Mays said. The investigation is not complete, and until it is, Colchester Police Chief Jennifer Morrison said, it's premature to say what caused the crash. The boats are being studied to determine how fast they were traveling. But she and Cpl. Michael Akerlind, who doubles as the Colchester harbormaster, agree that Dion and Wright realized they were on a collision course. "It wasn't an issue of not seeing each other," Akerlind said. Debbie Dion, the widow of the man who died, said her husband was on a fishing excursion with a buddy that night. He knew the boating rules well. Her husband drove the boat despite a visual impairment resulting from a car crash in 1995. He was legally blind, but not totally blind, Debbie Dion said, adding that he did not have a license to drive a car. Rodney Dion could still see well enough to spot things on the water and do tasks such as text, Debbie Dion said. She does not believe her husband's vision problem played any role in the crash and said it was likely a tragic accident. "He was loved by a lot of people, and he will be missed," she said. No one in the boats wore a life jacket, said Debbie Dion. "I was told that when he hit the water, it knocked him unconscious. Had he had a life jacket on, he would have floated," she said. "Instead he just immediately sank." Police do not believe that alcohol was a factor but are awaiting the results of Dion's toxicology tests. Wright was tested the night of the crash and was not drunk, according to Akerlind and Morrison. So far, Akerlind does not think charges are warranted, but he emphasized that not all the information is in. Once the investigation is complete, the file will go to Chittenden County State's Attorney T.J. Donovan, who has the final say on whether to bring charges. "There was nothing grossly negligent that occurred; nobody was impaired as far as we know at this point," Akerlind said. Seven Days' efforts to reach Wright were unsuccessful. When a reporter went to his home in South Burlington Friday, relatives said he was out of town. The shock from the collision — witnessed by dozens of boaters and people on shore — has not ebbed. Malletts Bay is one of the most popular spots on Lake Champlain for anglers, sailors and boaters. It's home to more than 1,000 moorings and slips at marinas. The bay's public boat launch, where both Dion and Wright put in their vessels, is one of the busiest in Vermont. At peak times, more than 500 boats ply inner and outer Malletts Bay. The bay is also popular because its coves can offer refuge from the swells that regularly form on the 120-mile-long lake, which can make boating an unpleasant experience of slamming against wave after wave. The night of the crash was calm and still, though. The bay was busy with boats, but not at peak traffic, according to police. At Champlain Marina, which is on the bay near the crash site, manager Bruce Deming said people are still talking about the tragedy. "Life was lost," Deming said, adding that the accident gives a "bad rep for boating in general." Each year, there are accidents — but not usually this severe, Deming said. Navigating the busy bay is similar to negotiating a packed lot full of moving cars, he said. "You know when cars are coming at each other in a parking lot and something's not quite right? People make mistakes; they don't always judge the situation correctly," Deming said. 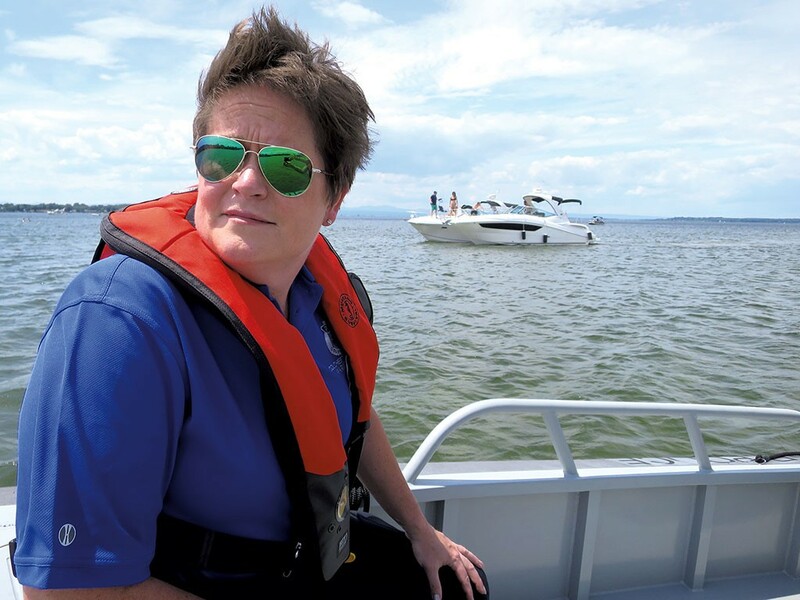 Akerlind carefully steered the 26-foot Colchester police boat out into the bay on a hot afternoon July 1, with a Seven Days reporter and Chief Morrison aboard. Akerlind had marked a red X on the boat's mapping system to show where the crash occurred. A late afternoon thunderstorm was in the forecast, so boat traffic was light. Sailboats bobbed on their moorings, and residents of summer camps and year-round homes on the shore mowed lawns and worked on their docks. Small aluminum bass boats putt-putted along, and several cabin cruisers, some as big as a house and flying the Canadian flag, powered over the water. The accident spot is an easy 10-minute cruise from the public boating access, beyond buoys near shore that order boaters to slow down. The site is where the bay starts to open up, just east of a point of land known as Malletts Head that leads to Marble Island. Akerlind remembered the night of the crash well. "We got the call at 6:30. I think I was on scene within 10 minutes or so." "There was a large debris field, and some fuel on the water," Akerlind recalled. Private boats and people on personal watercraft had gathered, as had several vessels carrying emergency responders. Wright's 35-foot boat had already sunk with a large hole in the stern. The four people aboard had gotten off safely. Dion's 20-foot boat was damaged and afloat, and his passenger had been transported to shore. Petty Officer Balmer was on the second shift of Coast Guard responders, who searched the waters for Dion at midnight along with other law enforcement. State police using sonar located his body on the lake bottom 60 feet below the surface around 2:30 a.m. They waited until first light to bring him up. Such crash scenes are fairly rare in Vermont, which, compared to other states, has few fatal boating accidents. From 2011 to 2015, five people were killed statewide in boating accidents, according to national reports compiled by the Coast Guard and the U.S. Department of Homeland Security. The national total was 3,205 people. Common causes for accidents include inattention, failure to follow navigational rules and boating under the influence. Drunken boating is a problem the Coast Guard sees periodically on Lake Champlain. But tickets are relatively few, according to the Coast Guard and state police. Sometimes BUI tickets are issued after reckless driving is observed, or when marine police do one of their regular "safety checks" on boats to inspect life jackets, registrations and boater education cards — proof an operator took the safety course. State law prohibits the operator of a vessel from driving while drunk — defined as having a blood-alcohol level of 0.08 percent or higher, the same standard as on roads. But operators are allowed to drink as long as they stay under the limit, and passengers can drink without restrictions. This differs from motor vehicle rules, which prohibit drivers and passengers from drinking. In the aftermath of the crash, some boaters are saying there should be speed limits farther out into Malletts Bay, near the accident site, where boaters often open it up. "People just hit the throttle and take off," said Ed Losier, the manager of Coates Island Marina on Malletts Bay. Malletts Bay is beautiful, but it's increasingly busy and requires caution, he added. "With the sailboats trying to come in and out under sail, the power boats coming in and out, it's extremely busy and dangerous," he said. "It can really get pretty wild out there." For information on the boating safety course, visit the Vermont State Police website at vsp.vermont.gov/auxiliary/marine.